“Mama, I’m going to use this box to make a car!” my preschooler announced with gusto and a jump into the air. The box on the living room floor had contained all the parts of a large castle - a Christmas gift. My third grader came down the stairs and said with growing curiosity: “What are you going to make? A car?” And I knew then that all three of them would be working on the project. It was the first day back doing school after our Christmas break, and I was feeling weary. I was tired from taking down decorations and cleaning the house all weekend, and I was not looking forward to getting back into our routine. The kids were feeling a bit sad about Christmas being over and not too excited about doing school, and I felt the same way. An impromptu car building project? That sounded messy and time-consuming, and I didn’t feel up for it. As the day went on, we did school as usual and had our mid-day meal, but in between everything and in all of their free time, my children built their car. They worked amicably and happily, running around and chattering nonstop the whole time. And slowly, the vehicle took shape. The box was opened into a big L, one part becoming the inside of the vehicle and the other part becoming the back wall. Another small box was taped to the front to make the hood. Two headlamps were taped to the front as headlights. A book-light and flashlight became tail-lights. Pencils were windshield wipers. Lots of little plates, cups, and bowls were taken from the dollhouse and taped around the “dashboard” as buttons and levers. The steering wheel? A felt doughnut, attached to a felt carrot, attached to a piece of foam wood from the play workbench. Various play plates and lids were the wheels. A piece of the play fire-station became the seat for my preschooler’s Pooh Bear. Room was made for someone else’s Pooh Bear and for someone else’s stuffed cat, too. and coming up with better ideas. By the late afternoon, they had made their vehicle, and it was exactly as they wanted it to be. I took pictures of them putting on the finishing touches and looking up at me with joyful, satisfied faces as they took it on its first spin around the dining room. It was only a week and a few days past Christmas. Between gifts from us, my parents, and my in-laws…there were many hundreds of dollars of brand-new toys to play with. Yet they had chosen to spend their time making a car using boxes that two of the gifts had come in, three old beloved stuffed animals, and various odds and ends. The lesson was not lost on me. And as I watched my children build their car that afternoon, I was quiet, but not because I was weary. 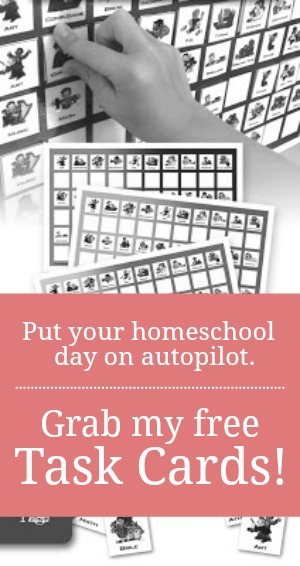 I was watching them with gratitude and joy, because they reminded me anew of some of the reasons why we homeschool and of why it works, and I remembered my days as a classroom teacher and how different “real” school often is. Before homeschooling, I taught fourth grade in a highly regarded private school. The students took standardized tests multiple times a year. An hour or two of homework across the elementary grades was the norm. There was barely enough time to cram in all of the “learning,” let alone pencil white space into the school day. 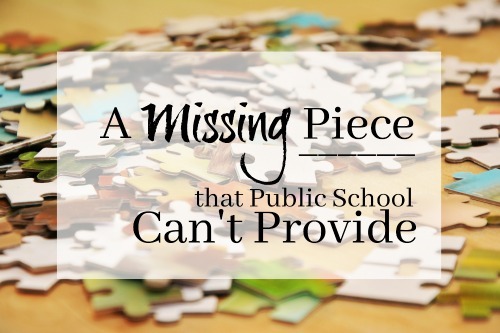 If I had written in my lesson planner, “Children will build cars out of cardboard boxes,” when I turned my planner over for its monthly approval, I surely would have had a question mark or a “See me, please” penned in the margin by my administrator. I would have been asked, “Are you doing simple machines in science? A force and motion unit?” I can imagine the incredulous response if I had said, “No. I’m just letting them build for fun, to see what they can create with their imaginations.” I smile to think of that, but it makes me sad at the same time. Had I wanted my former students to spend an afternoon doing such a seemingly meaningless activity, I would have had to apply some kind of framework to justify my use of that time. I would have had to make a KWL chart with them (Know, Want to Know, Have Learned) to “activate their prior knowledge.” Or they would have had to write predictions about what they would build, so they could “make connections to the learning.” Afterward they would need to discuss the experience with partners, preferably with a recording sheet, so they could work on “listening and speaking skills.” A “writing response exercise” would have been the perfect culminating activity, such as a Venn diagram to compare and contrast one group’s vehicle with another’s, or a sequence chart to write about the steps they used. Guess what? I didn’t make my own children do a single one of those activities, but they learned just the same. I spent five years teaching at one school and two years before that in different schools where I worked as a substitute and completed my Master’s degree. I saw the same problems in all three settings. If you were to ask me what is wrong with education in our country today, why so many schools are failing, and why American students are falling so dramatically behind when compared to students in other countries, I could give you a list as long as my arm based upon what I saw firsthand. But up near the top of my list would be this: that more emphasis is placed on the evidence of learning in the form of arbitrary standards, testing, and other visible “proofs,” than on the process of authentic learning and on giving children the time they need to grow and to truly learn. Later in the evening, on that cardboard-box-car-day, I e-mailed the pictures that I took to my parents. 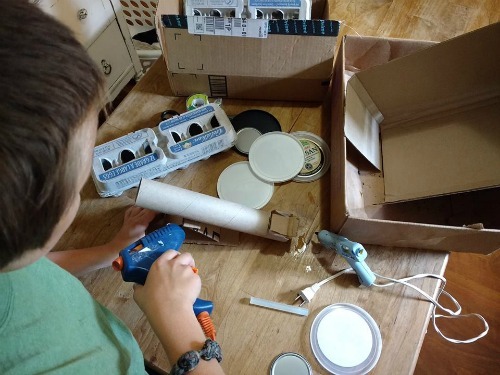 They responded with phrases such as “good exercise in engineering, ingenuity, creativity, and teamwork,” “so awesome,” “such creative uses,” and “totally impressed.” My husband and I are blessed to have parents and siblings who support us and cheer us on as we homeschool. My parents’ words made me smile. 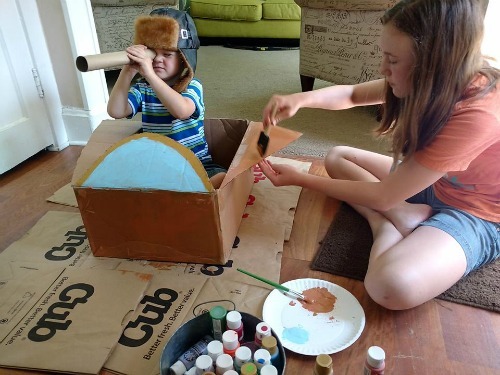 More than just doting grandparents, they see what we see: there is just as much “real” learning evident in experiences like building the car as there is when our children read aloud for them or show them a project or pages from their workbooks. It is January, and I have a mental list of tweaks, changes, and goals for this new year. Free time and white space weren’t on my list. Those things are already a significant part of our days, and I didn’t think I needed a reminder about their importance. But the afternoon of the cardboard box car showed me that I did. You see, so often I let myself feel guilty for our shorter and unconventional school days. I wonder if I should try to come up with more ways to fill our time. Even though all three of my children are performing at, or beyond, grade level (and in some subjects, are multiple grade levels ahead), I still worry if we’re doing enough. Our homeschool is so very different from a classroom, and yet my children’s progress is exceeding my expectations. My children gave me a much needed reminder that afternoon as they built their car. One of the many blessings of homeschooling is being able to give my children the gift of time. Because of homeschooling, they have white space - and lots and lots of it - built naturally into their days. They have time to be children. They have time to learn, not just superficially, but authentically. Homeschooling gives them the opportunity to utilize their minds, creativity, energy, ideas, and imaginations – in a way that is rarely possible within a traditional classroom setting. Where their learning would have been limited and constrained in the classroom, at home they are thriving. And on the first day back to homeschooling, at the start of January in a new year, it was the perfect time to be reminded of that - and to embrace it with joy. I often feel guilty that there's no "proof" of what we do in a day, so I'm quite glad for this reminder that the time spent proving that we've learned is not always necessary. Such a sweet story of sibling connection, too. I agree. Our proofs won't come until our kids launch. It's a daily lesson in trust and faithfulness, isn't it. My daughters spent yesterday afternoon thoroughly enjoying a mud-fight in our backyard with one of their best friends, who is also homeschooled. All of them had done schoolwork in the morning and spent their afternoon gloriously muddy, while most children in our neighborhood were still sitting at desks, their every interaction carefully ordered. White space is a wonderful aspect of homeschooling! Your recounting of the children's car-making made my heart sing! My concern is testing. When I don't check off what's on the schedule I feel time has been wasted and therefore when it comes time to test at the end of the year they are not prepared. We live in Virginia so I have to send in the results by August. But, I would love to just let them learn together like this. Anyone else deal with testing and still have fun learning moments like these? Thank you!!! I feel the same way about our shorter days. My mom teaches at a public school and my sister in law teaches at a private school. Sometimes I catch myself comparing the amount of time we spend compared to them. My children as well are at or above grade level though. Thanks for the reminder. The comparison trap is always easy to fall into, Leanne. You're not alone in that. Just keep fixing your eyes at YOUR home and YOUR kids. It sounds like you're doing YOURS well!